This week’s flashback is back t Killian’s pirate days, back when he was still hunting down Rumple to be brutally murdered by him get his revenge. Yes, only on Once Upon a Time can captain Hook be kidnapped by Nemo. It seems Nemo has a habit of collecting crew members who are obsessed with revenge so he can teach them that vengeance is hollow and they can all be one big happy family and he wants Killian to join him. As part of that he leads them to get some buried treasure – a key to the Land of Untold Stories which we’re supposed to be surprised by but, really, a mysterious key? Where else was it going to go? Narnia? Add in that Killian is still a little alien – being someone who was never cursed, he has little grasp of pop culture, modern technology or modern life: while endearing in small amounts this has to get frustrating with prolonged exposure. Twist, back to the past: it turns out one of Nemo’s men who is seeking revenge is Liam #2 – Killian’s little brother. Killian killed their father and Liam was looking for vengeance until Nemo recruited him. Killian quickly realises he needs to leave – because it’s easy for Liam to let go of vengeance when the target of that vengeance isn’t actually there. Killian is right – and only Nemo getting in the way stops Killian being stabbed and allows him to escape. Henry doesn’t leave of course, and when Liam decides to kill Killian, Henry is there to intervene. Liam sees the horror of killing a man in front of his son-figure in revenge for a man killing his father: another cycle, another orphan looking for vengeance created and they all end up in the hospital all issues resolved. Ish. In that hospital they also find Nemo, newly arrived from the Land of Untold Stories. Along the way they also dispose of the sheers, respecting Emma’s wish. Killian still tells Emma – who understands. The whole reason she got rid of the shears wasn’t so someone could use them as a weapon against her: but so she wouldn’t be tempted by them. It’s a bit simplistic but, still, I like it. I like it because we’ve focused so much on Killian and Emma that I think how Henry fits into this relationship also needed to be shown, I think because we needed to see some of the messier emotions because that’s part of the point of Once Upon a Time; to cut through the simplisticness and black-and-white easy resolves of Disney fairy tales. 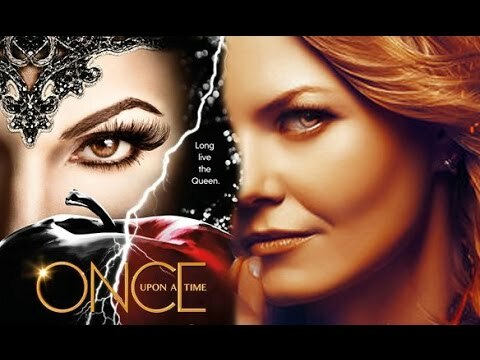 It’s why Snow White isn’t the protagonist, why Regina is no long an antagonist and why Rumble is a big mess of complex. Speaking of, Belle goes to hospital for an ultrasound and is extremely conflicted about how much she’s cutting Rumple out of their son’s life as the birth approaches. But was there really a need for EQ to kiss Rumple? Really? He goes back to Jasmin – he wants to help Agrabah. But it appears the whole city has disappeared.